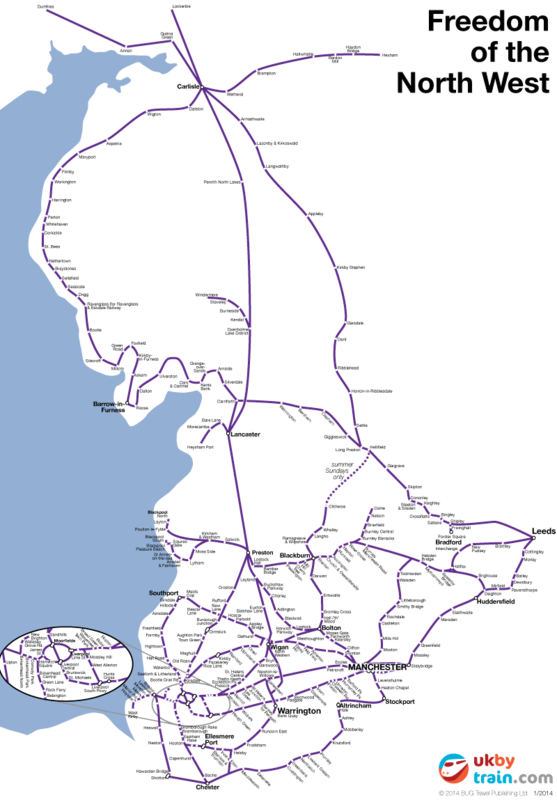 The Freedom of the North West Rover gives you unlimited rail travel in north west England allowing you to travel in West Yorkshire, Lancashire, Greater Manchester, Merseyside, Cumbria and parts of Cheshire, North Yorkshire and the Scottish Borders. With this pass you can visit Leeds, Bradford, Manchester, Liverpool, Chester, Blackpool, parts of Hadrian’s Wall and the Lake District. This pass is valid for travel after 8.45am Monday–Friday and all day on weekends and bank holidays. This restriction does not apply if you are travelling from Lockerbie to Carlisle on direct services only, although in this case the time restriction would then apply to onward journeys from Carlisle. Likewise this time restriction does not apply if you’re travelling on a direct service from any station between Barrow in Furness and Carlisle or vice versa, although the time restriction would then apply to onward journeys from Carlisle or Barrow in Furness.